Circumnavigating Vancouver Island is no small feat. While the distance of roughly 750 nautical miles (without side trips) isn’t terribly impressive, the weather challenges are considerable. This Google Earth screenshot crudely shows my anticipated route. The first 315 nautical miles will be familiar and mostly protected, but not necessarily easy. The Strait of Georgia, tidal rapids north of Desolation Sound, Johnstone Strait, and Queen Charlotte Strait are not places to be when wind is blowing or current is running. I plan to head north from Anacortes, stopping first in Howe Sound for several days. 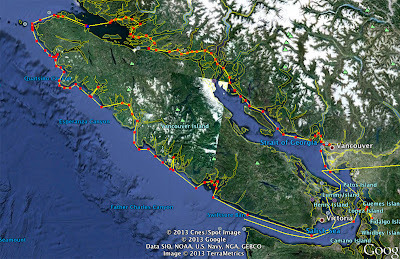 Then I’ll continue up the Sunshine Coast, towards Desolation Sound. After a some time in Desolation Sound, I’ll continue north to the Broughtons, and eventually to Port McNeill or Port Hardy. I expect to spend about three weeks getting to the north end of Vancouver Island. The goal along the way is to visit marinas and boat-related businesses to learn what’s new or different in order to update the Waggoner Cruising Guide. The trip gets more challenging once I head to the west side (outside) of Vancouver Island. The west side of Vancouver Island is fully exposed to the wrath of the Pacific Ocean and storms create famously dangerous conditions. The Canadian Coast Guard runs their surf-training program in Barkley Sound, since it apparently has some of the most consistently rough water in Canada. While the waters on the west side of Vancouver Island can be hazardous, they also settle down, particularly in the summer. The geography of the west coast of Vancouver Island makes it an ideal cruising area. Yes, the ocean can be impassable at times, but most of the actual cruising is done in relatively well-protected sounds along the way. Exposure to the full brunt of the Pacific Ocean is thus limited to manageable 20- to 60-nautical mile chunks. With a relatively speedy boat like the C-Dory, I should be able to take advantage of favorable weather windows and make quick, comfortable passages between sounds. Quatsino Sound is the northernmost sound on the west coast of Vancouver Island. The distance from Port Hardy to Quatsino Sound is about 70 nautical miles, across Nawhitti Bar and around Cape Scott. I’ll explore Quatsino Sound for four or five days. Then, when the weather is right, I will head towards the infamous Brooks Peninsula and Cape Cook. Depending on the conditions, Klaskino Inlet and Klaskish Inlet offer good protection and interesting exploring. After getting around Brooks Peninsula, I’ll work my way down to the Bunsby Islands, which I’m told are exceptional. The protection of Kyuquot Sound is just a few miles from the Bunsby’s, and I’ll spend several days in Kyuquot Sound. When the weather is right, I’ll dash down to Esperanza Inlet, which conveniently connects to Nootka Sound via Tahsis Narrows. I’ll spend another week or 10 days in this area. Another 25 nautical miles of Pacific Ocean gets me to Clayoquot Sound. After about 10 days in Clayoquot Sound, I’ll head south once more, bound for Barkley Sound, roughly 20 nautical miles away. Barkley Sound is home to the Broken Group, a spectacular area for gunkholing. After another ~10 day stay, I’ll make the long trip from Bamfield into the Strait of Juan de Fuca and back towards the San Juan Islands. I expect the total trip will take about two and a half months and cover more than 1000 nautical miles. Circumnavigating Vancouver Island is, in my mind, one of the three great boating trips in the Pacific Northwest (the others are SE Alaska and Haida Gwaii). I’ll probably depart Anacortes at the end of May. In the meantime, I’ve got more planning to do, some boat projects to tackle, and a desert road trip to Death Valley, Grand Canyon, Bryce Canyon, and Zion. Lots to look forward to! Islamabad has an incredible street framework and its persistently extending to suit the consistently developing volume of movement. As streets can get congested you can simply choose a more settled course. Rent a car in Islamabad For instance making utilization of Al Wasl Road to evade the quick and irate driving that regularly takes puts on the SZR. On the off chance that traveling toward Islamabad, hold up until the point when the morning truck movement has cleared before driving on Al Khalil Road and Emirates Road. The article has really peaks my interest Rent a Car Islamabad. I am going to bookmark your site and keep checking for new information.